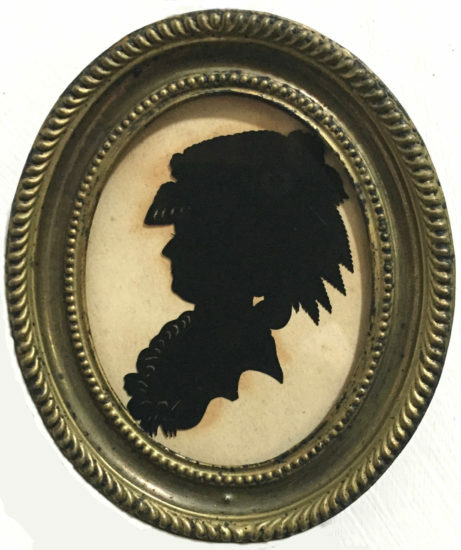 Last Wednesday I picked up an eighteenth-century silhouette by Isabella Beetham. Beetham is a well-known Georgian artist and her work is much prized by collectors today. She is something of a feminist icon. She is one of very few eighteenth-century female artists to build a successful career in the male-dominated art world of her time. The silhouette was sold by auction, part of the estate of a well-known collector and art historian. I had been lucky enough to place a winning bid. Collecting antique silhouettes has long been an interest of mine (my wife would describe it as an obsession). I learn so much from them, often in unexpected ways, and the habit lead directly to the production of the film Silhouette Secrets. I initially taught myself to cut silhouettes by studying a large collection of silhouettes by the Brighton-Pier silhouettist Hubert Leslie. These silhouettes, all cut in the 1920s and 30s, are now kept in the archives of the National Portrait Gallery. Ever since then I have taken every opportunity to study to work of other silhouettists. I still find new inspiration from them after so many years. The best way is to hold their work in my own hands and look closely at the marks they made. In my mind’s eye I can see the artist’s hands moving. I can tell exactly how they worked. My new Beetham silhouette is a Georgian lady in a large and fashionable hat. She is cut from black paper and pasted onto a once-white piece of card (now yellowed from exposure to daylight). She faces left and sits in an oval hammered-brass frame, typical of the period, measuring just 4” x 3”. The size of her hat makes her look slightly squashed in. Personally, I would have given her a bit more space by using a larger frame. The silhouette was described as “attributed to Isabella Beetham”. This means it lacks a signature or any kind of trade label, but looks a lot like other silhouettes by this artist. Since the silhouette came from a well-known collection I trust this attribution. However, as soon as I got it home, I sought to verify it by opening my copy of Sue McKechnie’s tome “British Silhouette Artists and their Work, 1760-1860” and looking for other silhouettes by Beetham. To my great surprise I found not just a similar-looking silhouette, but the exact same silhouette I had just purchased! The copy illustrated by McKechnie is described as a portrait of Marie Antionette, Queen of France, cut in the early 1780s by Isabella Beetham. She faces right, rather than left, but otherwise appears identical. This was a happy find. I now know who my Georgian lady is, as well as who cut her. Closer inspection began to reveal some interesting differences. The illustrated version is described as being pasted onto plaster, whereas mine is pasted onto card. The frame is described as ebonised wood, whereas mine is made of brass. And, of course, they face in opposite directions. 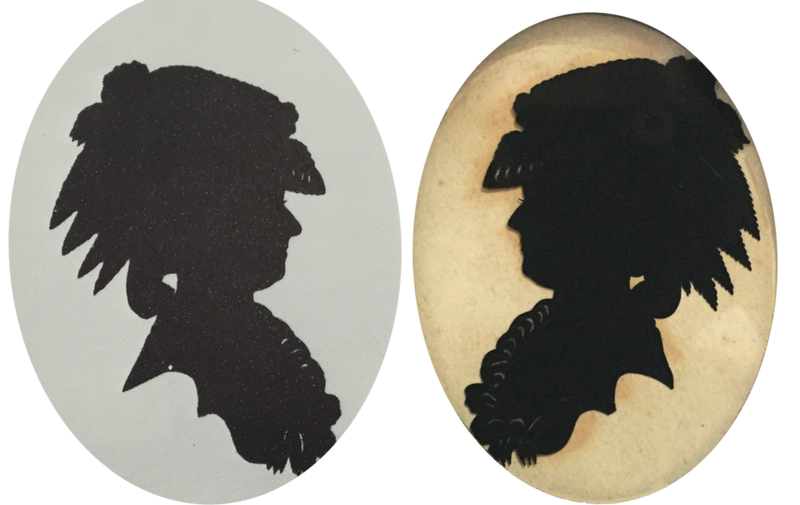 Clearly they are not the same silhouette, but are two copies of the same cutting. There are other differences too. Close inspection reveals minute differences in the outline. Although the shape is the same, some individual tweaks of the scissors seem to have shifted, athough none by more than 1mm or so. These differences are most obvious on the back of the hat and under the bust line. The faces are identical in every way. There are two possible explanations for this. The first is that, 235 years ago, Beetham was employing the same trick used by silhouettists today. She placed two sheets of black-faced paper together, black side in, and cut two silhouettes at once. This results in two copies facing in opposite directions. The minute differences are due to the paper moving as she cut. Any silhouettist will tell you that this can be a problem, however tightly you hold the paper. The two sheets can be secured together with sellotape (Beetham would have used small spots of glue at the corners) but as you cut around the head the two sheets become progressively more and more separated. They begin to move, resulting in minute differences between the two silhouettes. Both silhouettes also feature a number of ‘internal cuts’: places where the artist has pierced the paper to add extra detail. The most obvious of these is the space behind the back of the neck, which is clearly smaller on my copy. There are also a number of small cuts to indicate frills at the front of the blouse, also different on both copies. This indicates to me that Beetham separated the two copies after cutting the outline. She added these details to first one copy and then the other. The second possible explanation for these differences was suggested to me by the name of the sitter. Marie Antoinette (1755 – 93) was Queen of France from 1774 until the French monarchy was abolished in 1792, during the French Revolution and shortly before her execution by guilontine in 1793. Such a royal and famous sitter would have been important for Beetham. It’s likely that she kept a second copy for herself (using the trick described above) and used it to make further copies. She could then have offered reasonably-priced silhouettes of Marie Antoinette to anybody who cared to buy one! If this is true my silhouette could be one of many Marie Antoinettes out there, but we will only ever know for sure if a third copy comes to light! Of the two silhouettes I prefer my copy. The outline seems truer somehow, the shape tighter and more ‘together’ in an abstract sort of way. The pierced cut behind her neck seems to work better and whole heads seems, very slightly, to sit more properly on her shoulders. If it is true (as I suspect) that these two silhouettes were cut at the same time, then this more-pleasing shape tells me that my copy is the top copy. This is the copy the artist was actually looking at as she cut the profile. The McKechnie-illustrated copy is the one which moved, relative to the top copy, during the cutting process. This in turn tells me that Beetham was right handed. I infer this because my copy, which faces left, would have faced right as Beetham cut, since a silhouettist always looks at the white side of the paper. In general it’s much easier for a right-handed artist to cut a right-facing profile, while for a left-handed artist the opposite is true, so Beetham must have been right handed. I have written all this in such detail to illustrate the process by which I have learned so much about cutting silhouettes. The many silhouettes in my collection all seem to tell such stories. This is the kind of information I can learn from simply looking at an antique silhouette, held in my hand. During twenty years of cutting silhouettes I have learned so many tricks and techniques by looking at the work of other artists and emulating their style. The next time I encounter a woman wearing a flamboyant blouse she is quite likely to receive a silhouette with Beetham-style cuts in it to indicate the detail. This is how I have always learnt my craft, and how I continue to learn today. It’s quite possible that Beetham had a profitable side line in selling Marie Antoinette copies. Now that I own it I can of course offer the same service. If anybody would like a silhouette of Marie Antoinette (or, come to think of it, any celebrity you like) please do get in touch. this is a wonderful find Charles – very happy the silhouette found a proper home! Congratulations on a beautiful find. I’m very curious, up close I notice a small shadow under the nose and hat. How do you suppose the silhouette was secured to the paper paper? It also looks as if there is no glass pressing silhouette down to the paper? There is glass in the frame, I took care to avoid reflections when photographing it. I think the silhouette is simply pasted to the backing card. The nose and hat have lifted slightly at the edges.